SilverGlo™ Crawl Space Wall Insulation combines highly effective graphite-impregnated insulation with a built-in radiant heat barrier surface. This gives your crawl space walls an unbroken plane of R-11 insulation. SilverGlo™ also provides a vapor barrier which will hold back moisture from your crawl space walls, and direct flooding water down to your drainage and sump pump system. 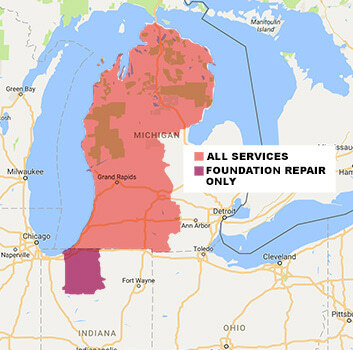 We serve Lansing, Grand Rapids, Kalamazoo, and many nearby areas in Michigan & Indiana. SilverGlo™ is an expanded polystyrene foam insulation that's been infused with graphite during its creation to improve its insular ability by 24%. It provides a radiant heat barrier on the visible surface and also provides an insulation rating of R-11. It can also be tailored for special projects or local code requirements, making it a versatile, effective solution. Keeping your crawl space dry is important to help prevent mold, rot, and musty odors. SilverGlo™ creates a vapor barrier on your crawl space walls that keeps moisture from making its way into your crawl space. Many times we see vented crawl spaces with fiberglass insulation on the ceiling. This creates the perfect storm for humidity and mold growth. During the summertime, crawl space vents bring in humid air where it's cooled in the crawl space. As this air cools, the relative humidity of the air rises, and the excess moisture is left on surfaces in the crawl space in the form of condensation. Some of this moisture ends up on the fiberglass insulation in your crawl space. When fiberglass insulation becomes wet or damp it does not insulate as well as dry insulation. The added weight from the moisture will pull it from the ceiling, leaving it in messy, useless piles on the floor. Wet insulation can actually become a food source for mold and rot, as they feed on organic material. Once mold and rot begin growing they spread until they leave your crawl space devastated. In short--crawl space vents and fiberglass insulation simply do not work! They are bad for your home, your wallet, and your health. At Ayers Basement Systems we have what you need to encapsulate your crawl space and upgrade its energy efficiency. Our warrantied products can keep water and moisture out of your home while making your home more energy efficient than ever!